Tak, coz... Pozbierawszy szczeke z podlogi moge tylko podziekowac za dedykacje! Ustalenie miejsca przekaze chyba Dave'owi i jego znajomym, bo to ewidentnie nie jest Heliopolis, a jego znajomi byli tam jeszcze jak tramwaje kursowaly w innych partiach miasta. No i ewidentnie wowczas w Egipcie byl ruch lewostronny - mercedes z tylu ma tez kierownice "po angielsku". Niezle! - na fotce ze strassenbahnen-online mamy ruch prawostronny - ewidentnie. 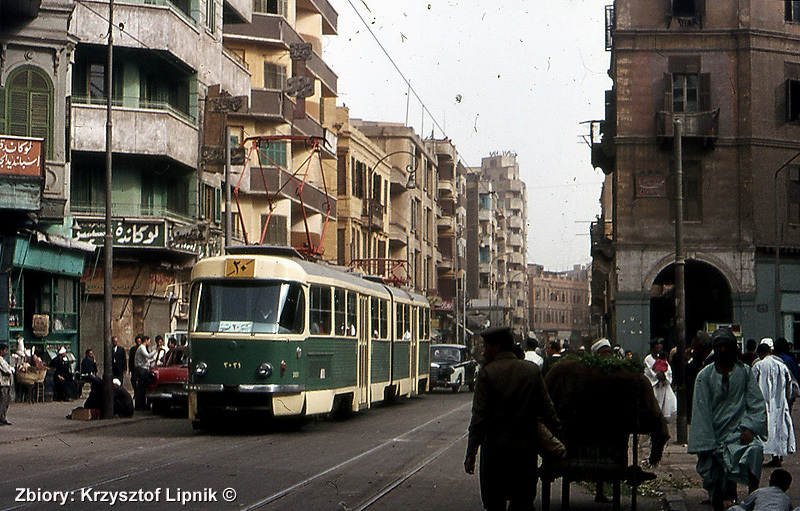 A very nice photo from the Golden Age of Cairo trams, when the network was very extensive and covered most of the city. The Tara K5KAR was a one-off design unique to Cairo, but they didn't last long and all were withdrawn and scrapped by the very early 1980s. This photo must have been taken when they were almost brand new. Older 4-wheelers of Belgian origin kept the service going until the Kinki Sharyo cars took over. At the time these Tatras were running, ex-Los Angeles Street Railway PCC cars were still operating in Cairo - now that would have been something wonderful to see. BTW - the photo is back to front. Have a look at the old city map at http://upload.wikimedia.org/wikipedia/commons/b/b1/Cairo_map1933_Nicohosoff.jpg and you will see exactly what has gone - only a small section in the far northwest (strictly speaking, all in Heliopolis city) is running now. That's right - ALL of the routes on that map are now extinct, except for the line from the rail station to Heliopolis. The southern areas of Cairo and Giza also used to have a trolleybus system some time ago. Das ist aber 3021 und Baujahr 1970! Und ich finde die K5 sooooo geil!!!! !